My husband wasn't really a big fan of meatloaf years ago but I eventually changed his mind after some good recipes I made him. For a twist to our usual meatloaf, this was a great alternative. I especially like it since it's like a dressed up hamburger without the bun. The deliciously seasoned beef patties gets a lot of flavor from grated onions and minced garlic cloves. Feel free to add in your favorite steak seasoning in place of plain salt and pepper. 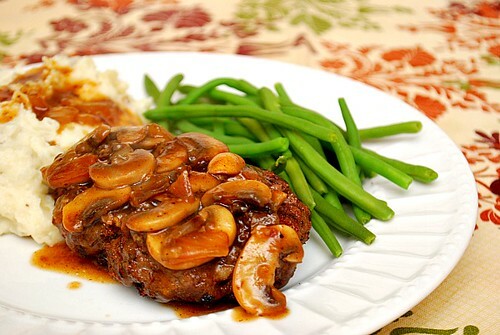 If those patties aren't enough, then the savory red wine and mushroom gravy will put the dish over the top. 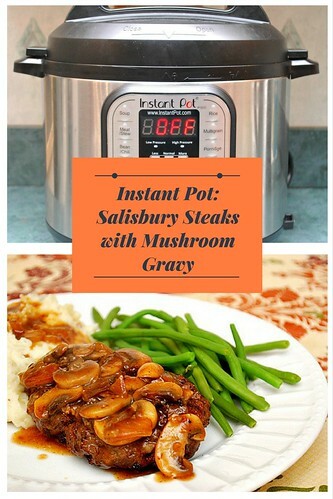 You can use either button or cremini mushrooms for the gravy. To make this gluten free, you can use gluten free all purpose flour but regular all purpose flour will do just fine. In a large bowl, combine grated onion, pepper, salt, garlic, and beef. Shape into 4 (1/2-inch-thick) patties. Press SAUTE and add 1 tablespoon butter. When foaming subsides, add patties; cook 3 minutes on each side or until browned; transfer patties onto a plate and set aside. In the now empty pot, add remaining 1 tablespoon butter. Add mushrooms and diced onions, cooking until onions are softened; about 4 -6 minutes. Sprinkle in flour over mushrooms and onions and whisk together. Slowly whisk in wine, broth and red wine vinegar. Return the beef patties into the IP. Serve patties over your favorite side and top with gravy.